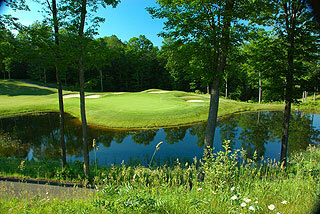 Shanty Creek Resorts in Bellaire just NE of Traverse City is a four season resort that has been has been ranked Silver Medal Resort by Golf Digest, Top 25 Golf Resort by Travel & Leisure Reader's Survey, and Best Golf Resort in Michigan by The Detroit News Reader's Poll. 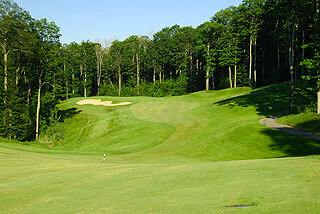 Four 18-hole championship layouts include the upscale 4-1/2 star Arnold Palmer designed Legend, the spectacular Tom Wieskopf designed Cedar River, one of Michigan's long time top public courses Schuss Mountain, and the player friendly and original design at Shanty Creek, the Summit. Three distinctive villages at the Summit, Schuss, and Cedar River offer a variety of accommodations ranging from standard rooms and suites to condominiums, chalets and fully equipped homes. 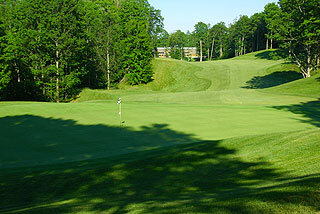 For more info on the resort, visit the Shanty Creek Resorts website by clicking here. This is one spectacular golf course! Cedar River is Tom Weiskopf's inaugural design in Michigan, and features play along some of the most memorable topography in the state. As evidenced by the above photos, the layout is contoured into the natural rolling terrain, providing not only some unique shot opportunities - but also some "unique shot opportunities" as in photography. Rated in "The Top Ten You Can Play" by Golf Magazine, Cedar River is 7000 yards of traditional golf at its finest, providing experiences that can be enjoyed by experts and novices alike. Four sets of tee boxes play to yardages and slopes that measure 6989/144, 6528/136, 5963/126 for men and 145 for women, and 5315/128. 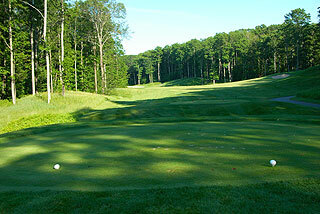 As the slope ratings indicate, this can be one tough golf course. However, there is a rhythm and flow to the layout with an ample mix of holes providing wide landing areas as well as those that demand precise tee shots and approaches. Golfers will find outstanding conditioning throughout the course, from tee to green, and will encounter large putting surfaces with varying degrees of undulation, which adds to the list of reason why this course is a pleasure to play on. The five par threes at Cedar River are very playable, and are reasonable in length from the blue tees (between 144 and 183 yards long). Most often there is an opening in front or on either side, with sand traps often framing the putting surfaces and suggesting the preferable entry zone. The par fives, with the exception of the beautiful 604 yard 18th (first photo in this review features the 18th green), are also quite score-able, when the route is carefully thought out. A combination of distance and accuracy is necessary on some of the par fours however, with the 5th and 12th holes being two of the toughest on the course. 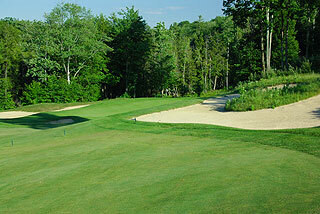 On the fifth a deep ravine comes into play from about 175 out, and means instant trouble. If the tee shot is not long and to the right of center, players might consider laying up to the bail out room short right of the green, and playing for an up and down par. Double and triple bogeys will be the result if the approach finds the high grasses on this downslope. The seventh is also an extremely interesting four par, which can result in a two shot swing depending upon the success (or failure) of navigating a water hazard that must be crossed off the tee and on the approach. 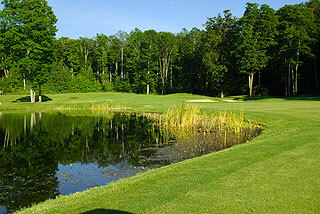 Players should note that the lake winds its way behind the putting surface on the left. The tee shot needs to cut across as much of the water hazard as distance will allow - to set up for a short or mid iron second shot. We recommend the white tee areas for the average golfer to facilitate the possibility of using more irons and less fairway woods on the approaches. Mixing and matching the blue and white tees (moving up to the whites for the par fours) is also a suggestion - as 6528 yards and a 136 slope is a bit much for the mid-high handicapper in this environment. On the back side the 12th hole demands a shot placement right of center, as trees on the left will block the approach regardless of the distance of the tee shot. The short par four 13th and par three 14th are two extremely unique holes that are situated in perhaps the most memorable section of the course. Rolling hills bordered by tall heather and fescue, strategically placed sand bunkers and trees, and severe undulations can be observed on hilltops overlooking the two holes. Land anywhere on the split fairway on 13 without landing behind the center tree or in one of the deep bunkers, and you have a good chance of scoring well. From a very elevated tee on 14, golfers will barely be able to make out the front of the green complex that is located below heathered mounds and bunkers, with little room long or short. These two holes - the shortest par four and par three on the course, have the capability of elevating your game, or leaving you incredibly frustrated at a missed opportunity. 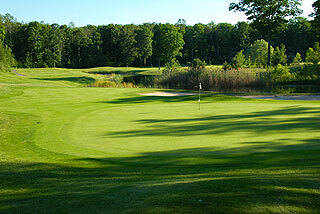 Of course, the finishing hole is one that golfers will remember most - especially if staying in the Cedar River Village. 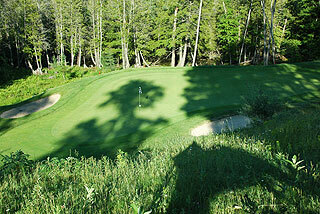 Many of the rooms at Cedar River, the restaurant and bar provide wonderful views of this hole, which presents one of the most interesting approaches in Northern Michigan. The tee shot is very intimidating, especially from the two back tees - as the fairway drops off steeply into high grasses that line a deep ravine situated along the left. The rolling fairway levels out for the third shot -which must navigate a pond immediately left and a large bunker to the right. Our advice - move up a tee on this one to facilitate hitting an iron to the green on the approach to this 3-shot par five. By this time, you will have realized that the sprinkler heads are the only on-course marking system utilized at Cedar River (although the tee boxes on the par threes have yardage blocks measured to the center of the green). Find one, and pay attention to the pin placement on this - and all the greens here, as many are large enough to make a one or two club difference in relation to the day's hole location. Small markers on the flagsticks will give you an idea of where the pin is located. Cedar River is a great reason to head up to the Traverse City area - which has to be considered in the same light as Gaylord when referencing prime golf destinations in the Midwest. Packages for this course and the other three at Shanty Creek are available at all three villages at this incredible resort. For more info, visit our page for the Cedar River Golf Course, with a link to the Shanty Creek website, by clicking here.